Vimeo has long been touted as the best alternative to YouTube. Many users and creators prefer it simply because there are no adverts on any videos that get uploaded. Although, this does mean that some features for creators you have to pay to use, but you do have unlimited viewing privileges with a free account (So you can go falling down the related video rabbit-hole to your heart’s content). Because of the associated costs and the niche community, Vimeo has built a reputation for high quality content from professional creators, including a growing number of videographers and filmmakers, and a much more constructive and responsive community than YouTube. With 100 million users and growing, Vimeo could soon become the go-to app for the highest quality content! 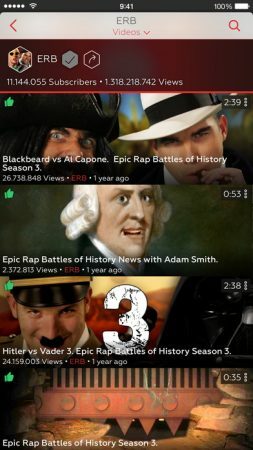 Professed by BuzzFeed to be “YouTube’s Dark Alter Ego”, Dailymotion has thrived, in part, because of its willingness to feature content that YouTube won’t touch. The home screen has a breakdown by categories in News, Film TV, funny, sports, gaming, arts, tech, Music etc which serves as a nice alternative to YouTube if you aren’t sure exactly what you are searching for. You get notifications when your friends or channels you subscribe to post a new video or playlist, and you can sync videos for offline viewing. It also has a great feature that allows you to search for videos locally and globally, and allows you to view some music videos not available in your country on YouTube. The interface is quick and easy to use, looks sleek and allows for 360 degree videos (I’m still waiting for the sense of wonder to wear off when I watch 360 videos)! Unlike the first two entries here Twitch isn’t a video hosting service. What it does is allow gamers of all skill levels to stream themselves playing their favourite games for free. You can use it to check out a game you are considering buying, watch someone play through a level or part of a game you are having trouble with, share your gameplay with the world or just kick back and watch the pros. You can search by game or by user if you know the channel you are looking for, and you have complete control over what you want to hear or see, in terms of commentary, video, and the channel’s chat. For example, you can watch the stream via an Xbox whilst you have the chat screen on your phone. The number of connection options are endless (see here for a more in-depth guide) and the app fully supports Google Cast. Twitch makes it a real joy to watch, comment on, and stream live gaming! After last year’s revamp, Vevo has been revitalised as a music video streaming service. The app itself runs really smoothly and the more you use it the better it seems to get. After choosing a few artists that you like Vevo will produce a list of suggestions and can be set to send you notifications when your favourite artists post new videos. Vevo now boasts a library of over 230,000 videos, not just of music videos, but live concerts and original shows as well, as well as the option for custom made playlists; Vevo even landed a deal with MTV to stream the VMA’s live this year! With a fantastic little mini player in the app as well, you’ll spend a lot less time searching for videos than on YouTube. The only downside is it only available in certain countries such as UK, France, Canada and the US (see the full list here). Squrl is laid out quite like Flipboard or Pulse, with a beautiful glossy finish and easy to use interface. But it is not just about looks (never judge an app by its home screen), Squrl manages to accumulate videos from an incredible array of sources! You can search through videos from YouTube, Netflix, Hulu, Ted Talks, Vimeo, CNN, IGN, Reddit, Twitter and many, many more. A great little feature is the ability to connect your Squrl account to other social media accounts, such as Facebook, Twitter or Netflix, letting the app take these sources into consideration for recommendations (based on your likes and your friends’ likes). You can also browse by topic or what has been trending in the last week or even month! Squrl works best when you are browsing for recommended content, or through i’s own categories, rather than searching for specific clips (although it has been great for finding rare clips or interviews). I couldn’t have put it better myself! Pluto TV is the next step away from cable TV (and away from these guys), in a totally different way to Netflix, or other similar services. It allows you to enjoy music, movies, news, sports, TV shows and viral videos, with over 100 different channels of content available across the app. My personal favourite channels include Drake, The Young Turks, or 80’s Music, but there are so many to choose from! You can project it to a TV full screen with little to no drop in quality and the best bit, is it’s all free; apart from having to watch the occasional ad from the video provider. Frequency is another video aggregating service that gathers clips from numerous social media and news sites like YouTube, Twitter, Facebook, CNN, NBC, Bleachers Report etc. Opening up Frequency gives you a timeline (almost like Facebook) of the channels you follow on frequency, I have found it a great way to keep up to date with my favourite channels, which can be a little harder on YouTube. The app also makes it very easy to find and browse for new content, with a fantastic feature allowing you create your own channel line-up from sources of your choice – with over 1000 channels already waiting for you when you log in! It has been converted almost seamlessly from IOS and the only downside, in my opinion, was their lack of support for Chromecast, but that feature has been added with a recent update! Vidme has been built around a community of people that love the craziest, weirdest and most interesting internet videos. You don’t even need to sign up for an account (though you can if you want) and uploading a video literally takes 4 clicks! Don’t expect to find everything you would find on YouTube here though, it is aimed more at the indie viral market. It’s like Imgur for video, with quick and easy video uploads, this is a must have for keen redditors (a free account gives you up to 500mb of uploads per week). You can browse by searching or through the categories, which include the Vimeo Staff Picks, The Vimeo HD Channel, Everything Animated, Inspirational, and Slowmotion & Timelines to name a few. Although it isn’t as established, or as popular as YouTube, Vidme is a great place to find and upload viral video content. I have come to realise that ProTube is like YouTube on steroids, like YouTube plus, like YouTube at the end of the high school transformation movie. Its Picture-in-Picture mode works far better with IOS 9 and 10 than YouTube and you can listen to audio in the background of other apps. Honestly, when I first tried it, I wasn’t wholly sold on ProTube. Then I read this article, and I began to appreciate all the little subtle improvements that it makes to YouTube. Instead of being restricted in where you can share videos (ie Facebook, Twitter, and Google+) you can share to any platform you want. The hexagonal buttons and UI in general are clean, refined and unique, and whilst the colour scheme is reminiscent of YouTube, it still holds its individuality. ProTube is definitely an app you’ll find it hard to live without once you’ve got used to it! Want to watch videos on how to do literally anything? Then HowCast is definitely for you! It is a easy as typing in what you need, or shaking your phone for a random selection of videos (this can lead to some hilarious videos, like “how to deal with a knocked out baby”). You can bookmark your favourite videos, browse your history to find videos you watched before, and toggle video quality in the case of poor Wi-Fi! With 1 billion views on the website, HowCast will only continue to grow their library and become better and better to guide you through you DIY life. If you have any comments or think we missed any let us know! For more YouTube alternatives check out our 10 alternative sites to YouTube or our 8 best tips and tricks for YouTube.